If you could design a massive technology project from the earliest stages all the way through deployment and complete and total user adoption, what would the plan look like? Probably it would involve expert advisors, cooperation among all the participants, top-notch products, sufficient time, knowledgeable feet on the ground, extensive training, broad executive support and a budget that wouldn't hamstring decision-making. Perhaps it would resemble the Villanova University rollout of unified communications. CIO Stephen Fugale is no stranger to large and ambitious IT initiatives. After all, the university where he has worked for six years, based in suburban Philadelphia, with 10,000 students and 2,500 faculty and staff members, was named the top wired college in America last December in a joint research project of The Princeton Review and PC Magazine. In this regard, Villanova beat out MIT. It beat out Stanford. It beat out 358 other schools that make up the Review's survey of the best colleges in the country. What makes it so amazing? Fugale said simply, "We look to add convenience, service, functionality." That translates to more than simply making sure every freshman is handed a notebook computer (refreshed at the end of the sophomore year) or going wireless across the 254-acre campus (a project slightly more than halfway done, according to Fugale). The school provides a state of the art working lab in its business school that "replicates the world of being on the trading floor," said Fugale. Nursing students have been issued PDAs to get mobile access to clinic applications. The graduate nursing program has experimented with providing students with webcam access so they can interact with professors. The engineering college has tried out tablet PCs for distance learning. Students can use a browser-based laundry application to check the availability of dorm washers and reserve them, then text message laggards whose clothes have been left in the dryers. Student ID cards not only grant access to buildings, they can be used to make purchases from online campus vending machines, as well as 40 merchants off campus. At Villanova, said Fugale, "We like to view the technology offer we have as broad.... You experience it in multiple ways." Yet one area where the campus seemingly lagged was in its telephone network. 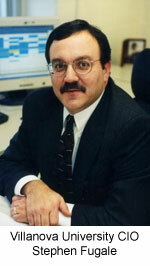 "We have known our old system--a typical PBX system--had passed its end of life," said Fugale. Villanova was waiting for voice over IP (VoIP) to "harden." Once it had made the determination that the products and services were mature, however, and budget was in place, Villanova sprang into action last year. Fugale and his University Information Technologies (UNIT) team put together a task force made up of the heaviest telephony users on campus--admissions, athletics, the IT organization, the office of the chief financial officer--as well as representatives from each major college, nursing, engineering, business, and liberal arts. They started with a peer school comparison to find out what other comparably sized campuses were doing. They also explored telephony use in the corporate world, locally and otherwise. From this, the team began to assemble its baseline requirements. At about the same time they had two companies, Vodis Partners (now The Presidio Corp.) and Commonwealth Communications, come in to do assessments of its campus network infrastructure and establish what needed to be changed to support VoIP. Using Gartner "Magic Quadrant" research, they developed a list of vendors, value-added resellers (VARs) and managed service providers they were interested in exploring. They also brought in Fortune Consulting as an expert in telephony to help oversee the entire process. "Frankly, while widely publicized," said Fugale, "the technology of VoIP was not something we had hands-on experience with. We wanted to augment ourselves." Then began the company visits--involving a group of four to six people, including Fugale--to every company under consideration. They talked to the vendor's R&D people, saw demonstrations of the technology, met with senior management and integrators, answered questions about Villanova and, said Fugale, looked them "eye to eye to gauge their interest and desire to work with us [in] what we were trying to accomplish." As the school compiled its roster of requirements, it constructed what Fugale called a "hierarchical decision model" with specific criteria. The vendor evaluation eventually consisted of six categories: technical architecture, total cost of ownership, VAR or integrator viability, implementation, training, and vendor viability. Each of those, in turn, consisted of four to eight more specific levels of criteria, a total of 40, each weighted to reflect priority. For example, under technical architecture, criteria included user requirements as mundane as caller ID and as sophisticated as the ability to support SIP (session initiated protocol) phones or to support wireless and mobility. "Our goal was to try to quantify our selections as we did vendor evaluations," Fugale explained. Those 40 criteria drove the definition of hundreds of requirements that translated into a request for proposal (RFP). That was made available on Labor Day in 2006, he recalled, and responses were returned between September and December. The RFP went out to 11 sources; the school received 10 responses, including one opt-out and one managed service it rejected. The task force took the eight remaining RFP responses and went out for a "best and final offer," said Fugale. Then those finalists came on campus to make formal presentations. That's where the final decision was made. "The final presentations really showed you the companies that understood our requirements," he said. "They understood higher education and Villanova, understood what we were trying to accomplish. They could show a fairly detailed implementation plan. That was a striking differentiator in the finalist presentations." Avaya was the vendor left standing. At $3 million this project wasn't a paltry win. In fact, Fugale said it was one of the larger RFPs circulating in the Philadelphia area for the last 12 to 18 months. Avaya's portfolio of products for the sale included Unified Communication Center, e911, Call Center, Computer Telephony, and Interactive Response. But Avaya didn't win it alone. It worked in partnership with Extreme Networks, which would provide switches for the network upgrade, and Empire Technologies to act as the reseller. Avaya was no stranger to the campus either. Villanova was an Octel customer, which happened to be the voice mail product that Avaya sells. Plus, it has a strong relationship with Meru Networks, the wireless access point provider the school was working with for its wireless rollout. During the entire evaluation process, Fugale said, the triad worked "hand in glove. They knew our campus. They knew all 50-plus network closets." It took 18 months from the time the task force was formed to the day when Fugale went to Villanova's president and board of trustees for final approval. The actual deployment of the system went blazingly fast. The equipment arrived in a pod, "preconfigured remotely, then configured further here," said Fugale. During the same period, the network closets underwent their upgrades with rack and switch installations. The school placed its core communication servers in two locations for redundancy. The current environment was frozen so the new system could be populated from the old one; and 5,000 new phones were distributed. In the meantime, training had begun. That consisted of providing on site classes with an Avaya trainer, as well as making videotapes of her sessions available via the Web. Paper materials were also made available. Following deployment, the trainer returned for additional sessions. IT staff received more extensive technical and administrative instruction. The cutover was planned for July 4, 2007, involving the efforts of 40 to 50 people from the school's IT crew and Avaya and Empire. They worked from building to building, starting with the most pivotal ones--the health center, the president's office, public safety. By the following Saturday, it was largely finished. Said Fugale, "It was fairly flawless." But just in case problems arose, Empire and Avaya set up a call center in the UNIT building for quick response. Fugale doesn't recall anything more serious than the need to pull wire in a few locations where people had used up all available network jacks. The final layout of communications at the school is hybrid. Some buildings are pure VoIP; others are digital phones, depending on the state of the network in a given building. Eventually, as additional pieces of the infrastructure are upgraded, VoIP will be rolled out more extensively. But in either realm, the basic capabilities Villanova sought exist--call waiting, access to enhanced 911. In the event of a power outage, the school has backup power and "UPSes spread all over campus" so the phone system can still operate. Likewise, quality of service is exactly where Fugale expected it to be. "My user community has the expectation--as with the old phone system--that when they pick up a handset, they've got a clear and high quality dial tone. We had to upgrade portions of our network to make sure quality of service was there." Aside from adding phones here and there to address growth in faculty and staff, Fugale said he sees the major growth happening in the different applications that will run on the system. Recently, the school migrated from Sun's iPlanet messaging server suite for messaging and the Mozilla Thunderbird e-mail client to Microsoft Exchange and Outlook and Outlook Web Access. Now it's positioned to more fully exploit its new communication network. Said Fugale, "The standard user would be able to get voice mail or e-mail on their PC or in concept on their phone. We also have the capability to do SIP phones. We have the capability for remote workers to dial in from the PC, log into the Avaya system, and have it be invisible as to whether I'm working in the office or at home." The campus will implement a call center, probably first in the IT department, to use interactive response. "When Steve Fugale calls the help desk for an issue," he said, "a screen comes up saying, 'It's Steve Fugale at extension 4402; he has a Dell D610; he's an administrator.' OK, Steve, what's your problem?" And at some point, he expects the school to do speech recognition, as opposed to requiring the use of operators to do smart call routing. Through it all, Fugale said, the IT organization will continue putting its energy into those projects, small and large--laundry room texting and unified communications--that will have "the best impact on the teaching and learning and living environment" at Villanova.